Life is challenging. A few long hours up the road in the mountains of the Sierra Madre range that runs along the eastern edge of Oaxaca, Mexico, the leadership of TerraMica was introduced to the indigenous Mixe people who were in a fight for survival. After years of neglect from domestic and international organizations and the lack of proper tools with which to improve cultivation of their crops, coffee farmers in the Sierra Mixe region were vulnerable to an unseen enemy. Enter a strain of soil fungus that, with a little guidance, a little help, and a little education, could have minimized the destruction that soon arrived at their door - ultimately leaving their farms and region in financial ruins. With coffee trees that were close to 50 years old, these trees were tired and uncared for, the condition for a total crop failure was ripe for the picking. Enter the La Roya plague, which ultimately decimated most of the region’s main cash crop … their coffee trees. Beginning with an end in mind, TerraMica immediately jumped into action by developing and implementing a multi year strategy that would begin to help lift these industrious farmers out of the dire condition they now found themselves wrestling with. The financial impact is being felt throughout the entire mountain region. Coupled with a devastating two-year drought, the secondary crops of corn and beans had failed with limited production as well. Just getting food the table for each farming family was a herculean effort. In order to address the agricultural component of the plan, TerraMica needed to have a serious assessment of the baseline quality of crop being produced out of this region. We partnered with a long time friend, F. Gavina & Sons Coffee Company based in Vernon, California to accomplish this task. Bringing a sample of this year’s first harvest up to the U.S., we traveled to the quality control and roasting lab of Gavina’s in order to properly evaluate this region’s remaining coffee crop. 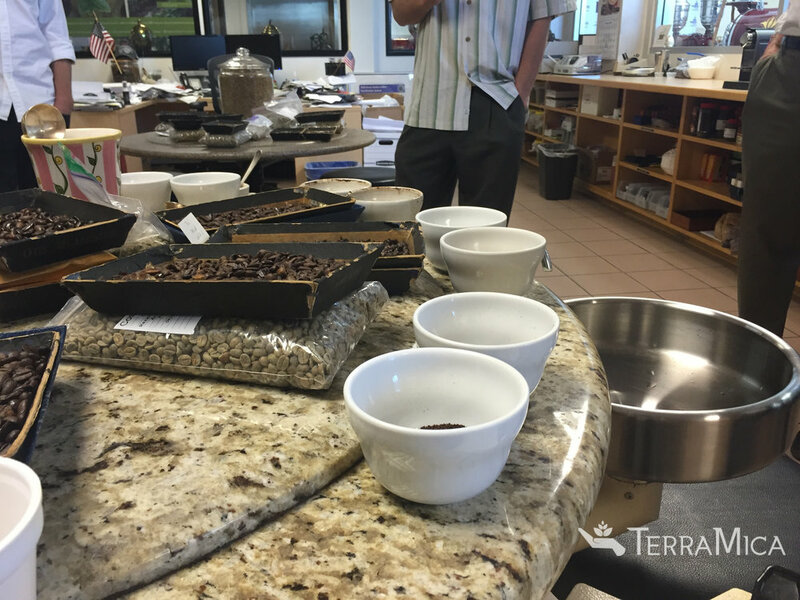 The Gavina team provided a group of individuals from within the U.S. coffee industry to evaluate every aspect of the sample crop. With our crop and quality assessment in hand, and a proper plan of action in place, TerraMica is setting a course to implement an aggressive poverty alleviation component for these industrious farmers to begin elevating themselves out of poverty and into a new season of growth and sustainability. Working shoulder to shoulder with the farmers of the Sierra Mixe region, we are providing hope for their future. Follow along with us as we work and serve along side our neighbors in Oaxaca, Mexico.